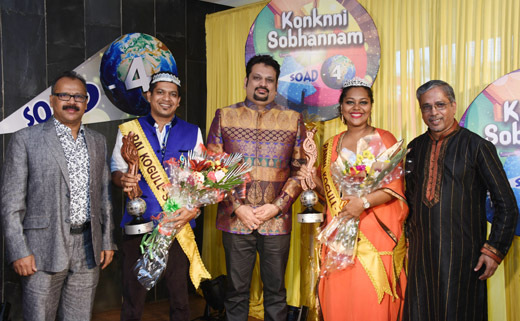 Mangaluru, May 31: Soad-4 ‘Rai Kogull’ and ‘Ranni Kogull’ were crowned at a glittering ceremony, on May 31, 2015, at Chefs CX, Mannagudda, Mangalore. Robin Sequeira won the title ‘Rai Kogull’ scoring a total of 273 marks, out of 300 in the Final Round, while Ashwin D’Costa was the runner-up scoring 267.5 marks. Jacqueline Fernandes won the title ‘Ranni Kogull’ with a total of 269 marks while Smenita Pinto, the runner-up scoring 268.5 marks. Well-known music composer and singer Sidhanath Buyao, Goa, crowned the winners. Congratulating the winners, he assured them of an opportunity to sing in his upcoming album. Nithin Koottungall (Kerala), Sonia Shirsat (Goa), Joel Pereira (Mangalore) and Anil Patrao (Mangalore) were the judges of the Final Round. ‘Rai Kogull’ Robin Sequeira was awarded a cash prize of Rs. 50,000/- (sponsored by Roy Castelino, Mangalore), crown, sash, bouquet, trophy and a gift hamper along with a vintage wine bottle (sponsored by Roshan D’Souza and Dilraj Rodrigues). ‘Ranni Kogull’ Jacqueline Fernandes was also awarded a cash prize of Rs. 50,000/- (sponsored by Jyothi Diana Dias and her children Andrea and Adreena Dias, Mangalore), crown, sash, bouquet, trophy and a gift hamper along with a vintage wine bottle (sponsored by Roshan D’Souza and Dilraj Rodrigues). Mandd Sobhann offered the winners to be the Ambassadors of Konkani for the next one year, which they readily accepted. Both the runners-up were awarded cash prize of Rs. 25,000/- each by Mandd Sobhann and a vintage wine bottle (sponsored by Roshan D’Souza and Dilraj Rodrigues). The winners as well as the runners-up thanked everyone who supported them and also vowed to promote Konkani, through their singing and in any other way possible. The lots of the ‘Guess the Winner’ contest were drawn and Nishma Murial D’Souza emerged the lucky winner of Rs. 10,000/- sponsored by Baba Ken Monteiro, Canada. Mandd Sobhann Gurkar – Eric Ozario, President – Louis Pinto, Lawrence D’Souza of Daijiworld and Richard Monteiro (representing Roshan D’Souza and Dilraj Rodrigues) were also present on the dais.